Graham Farmelo is the author of a remarkable book on Paul Dirac, The Strangest Man (Faber & Faber, 2009) and has now followed this with a fascinating study of William Churchill’s involvement with the development of The Bomb (as I will refer to it throughout). The book begins towards the end of the life of Churchill, when he confided in his doctor in 1955 ‘I am more worried by [The Bomb] than all the rest of my problems put together’. Churchill had a fascination for science, in particular physics which was driven by a passion for the work of H. G. Wells, reading all of his novels. In particular, Churchill was struck by Wells’s novel ‘The World Set Free’, published in 1921 which speculates about the consequences of radioactivity and effects upon mankind. Churchill was a prolific journalist and writer and remarkably wrote a pamphlet ‘Shall We All Commit Suicide’, in 1924 and speculated that a bomb could be made, ‘no bigger than an orange….with the explosive power of tons of cordite’. Thinking ahead to The Bomb, this was an astonishingly prescient insight. Churchill later published ‘Fifty Years Hence’ in 1931 speculating on science and the possibility of nuclear weapons. One of the key individuals who features throughout this book is Frederick Lindemanm (to become Viscount Cherwell), a teetotal, vegetarian theoretical physicist who knew Einstein, worked in Berlin and became Professor of Physics and Head of The Clarendon Laboratory, University of Oxford in 1919. Churchill met Lindemann or ‘The Prof’ as he came to refer to him in 1921 and by 1932 was a regular visitor to Chartwell, Churchill’s country house. Churchill said of Lindemann that ‘he is one of the best scientists and best brains in the country’. Fermalo points out that this was a view not shared by many other physicists, especially Rutherford. ‘The Prof’ became to be known as Churchill’s lap dog and said of Churchill ‘a scientist who missed his vocation’. Lindemann had a hold over Churchill concerning science related matters for around 30 years. When Lindemann published ‘The Physical Significance of Quantum Theory’ in 1932, Churchill delayed writing a Budget speech, reading it from cover to cover, becoming fascinated by quantum theory. Others, including Rutherford stated, as Fermalo points out that Lindemann had little grasp of the subject. Fermalo details how despised Lindemann became, especially in Oxford with the eminent philosopher Isaiah Berlin saying ‘[Lindemann] is a genuinely a horrible figure…he is the only person, I think, whom I have ardently wished to murder’. However, Lindemann’s wish was to increase the reputation of The Clarendon, believing it to be (as indeed it was) in the shadow of The Cavendish at The University of Cambridge, under the direction of Rutherford. From 1933 onwards, many gifted Jewish scientists felt the need to leave Germany, and later other countries as the threat posed by Hitler became apparent. The Government set up ‘The Academic Assistance Council’ to try and place them in short term jobs, with the hope of finding more permanent positions. Lindemann toured Germany in his chauffer driven limousine searching for talented physicists. He attracted gifted physicists to The Clarendon by simply paying them more, as he had managed to attract significant funding from industry. Lindemann even arranged for Einstein to have a short stay, arranging rooms in the more than congenial surroundings of Christ Church College. One such émigré physicist was the Hungarian Leo Slizard, who fled to Vienna and was the first to point out how nuclear energy might be harnessed to make a bomb. Slizard began, what Fermalo describes as a career as ‘an itinerant nuclear ambassador’, and ‘a strolling player in the field of nuclear theory’ arriving in London in 1933. Slizard worked initially for The Academic Assistance Council and while crossing a road in London had an epiphany moment and envisaged a nuclear chain reaction. When Churchill became First Lord of The Admiralty he appointed Lindemann as his personal advisor. War broke out and in May 1944 Churchill became Prime Minister, with Neville Chamberlain stepping down being made President of The Board of Trade, crucially with responsibility for science. Inevitably, Lindemann came to run the show and as Fermalo points out became the most influential scientist ever to work at the heart of British Government. The importance of nuclear energy was becoming clearer and a ‘Uranium Committee’ was set up under G. P. Thompson of Imperial College to coordinate nuclear work across Cambridge, Oxford, Liverpool, Birmingham and Bristol Universities. Lord Hankey was appointed Chair of ‘The Scientific Advisory Committee’ to investigate the possibility of nuclear weapons. A committee, named MAUD was set and a final report, written largely by James Chadwick concluded that a Uranium fuelled bomb was possible and should be pursued as a matter of priority. There was, however, disagreement as to where a bomb should be built and more importantly should Britain go it alone. Henry Tizard, Scientific Advisor to The Air Ministry was one critic and argued that it would be ‘absurd’ to try and construct a bomb on British soil and advocated collaboration with The Americans. Also, highly critical was the brilliant physicist Patrick Blackett, who had been one of the so called ‘Rutherford boys’ at The Cavendish. Chadwick disagreed. Lindemann persuaded Churchill to become the first national leader to approve the development of nuclear weapons. Sir John Anderson became overseer of The British Bomb and realised that the MAUD Committee’s estimate of a bomb being available within about two and a half years was overly optimistic. Nuclear related work became essentially Churchill’s thiefdom, with Lindemann as his willing henchman The proposal was that 235U be produced in Canada, with the Americans acting as consultants, with the British and American efforts being separate, but linked. President Roosevelt personally made an offer of cooperation. Mark Oliphant, another ‘Rutherford boy’ was working on radar, and while on a visit to America ‘let slip’ the conclusions of The MAUD Report, to the consternation of others. Oliphant argued for British, American cooperation and was the first to mention, what became The Bomb, to Robert Oppenheimer, who was to become Scientific Director of The Manhattan Project (more later). President Roosevelt even wrote to Churchill saying that a nuclear project ‘may be coordinated or even jointly conducted’. A move was then made that turned out to be highly controversial, when the Chairmanship of The MAUD Committee was handed over to the industrial giant ICI, under ICI’s Technical Director, Walter Akers. Roosevelt and Churchill met over Christmas 1944/5 but Roosevelt did not inform Churchill of America’s decision to pursue a nuclear weapons programme. the President would have a veto over any British venture into nuclear power. So, Churchill at a conference in Quebec in 1945, to be later known as ‘The Quebec Conference’ gave the President an unprecedented veto on the development of nuclear power in the UK. Churchill believed that this was the only way of collaborating with the American Bomb Project and ensure that British scientists had learned enough to build ‘our own’ weapon after the war. Fermalo then introduces the great Danish theoretical physicist, Niels Bohr into the debate. Niels Bohr, known as ‘The Great Dane made a dramatic escape from Denmark in the unpressurised bomb bay of a fighter bomber aircraft. Bohr had worked at Los Alamos and became very friendly while there with Joseph Rotblat. Rotblat, notably walked out of The Manhattan Project, going on to campaign against nuclear weapons and winning The Nobel Prize for Peace. Bohr was very fearful of a nuclear arms race and believed that ‘nuclear secrets’ should be shared, including the Soviet Union. Bohr believed that this ‘would bring a new era of harmony and trust’. Bohr made a tour of US nuclear weapons related facilities and was astonished by the huge industrial effort underway. John Cockcroft was put in charge of the Chalk River facility in Canada, where a heavy water moderated reactor was constructed and could make useable quantities of 239Pu. This posed a problem as the fission properties of 239Pu required a different detonation technique. Rudolph Peierls, who together with Otto Frisch had produced the absolutely crucial ‘Memorandum’ in 1940, showing that that The Bomb was feasible and could be constructed with much smaller quantities of 235U than had been believed- in old units about 11 pounds. Not only that, they suggested that bringing two sub-critical masses of 235U together by an explosive technique, essentially a gun barrel method would result in a huge explosion. They also speculated on the consequences of such an explosion. The Frisch-Peierls Memorandum can be seen as the document that led to The Bomb and in my view, one of the most important pieces of scientific work (and speculation) to have ever been produced. Fermalo does stress the importance of their work, but could perhaps have said even more about the significance and ultimate consequences of their Memorandum. Peierls ran the Implosion Group at Los Alamos and together with James Tuck developed an implosion technique that involved completely surrounding a spherical ball of 239Pu with explosives and imploding the material totally uniformly. Fermalo then introduces Klaus Fuchs a theoretical physicist, who shared an office with Peierls at Los Alamos, was a close friend of the family and even lodged with them. Fuchs turned out to be a Soviet spy, was exposed after the war having passed on a vast amount of information to the Soviets, including, quite incredibly the blueprint of the 239Pu fuelled bomb that was used to destroy Nagasaki. Fuchs was tried, pleaded guilty and was jailed. He was later released having not served the whole of his sentence and became a Professor in East Germany. Peierls was devastated and the Americans incensed. Roosevelt died on 12 April, 1945 and Harry S. Truman assumed the Presidency and as we shall see had significant consequences. Following the successful testing of The Bomb, The Trinity Test, Fermalo tellingly points out that Churchill was ‘completely carried away’ and that this ‘would now redress our position, we could blow out Moscow’. What Churchill did not know was that Stalin was very well informed about nuclear weapons, even having a copy of The MAUD report, leaked by the spy John Cairncross. It is telling that Patrick Blackett, now Professor at Manchester University, who joined The Maud Committee in 1940 and after the absorption of the British nuclear effort with that of the US had ‘nothing to do with it’ was appalled, as were other key physicists. In 1945, Clement Attlee took over as Prime Minister, Churchill being severely rebuffed at the polls. Attlee needed a nuclear policy using the expertise gained by British scientists working on The Manhattan Project and set up ‘The Advisory Committee on Nuclear Energy’, which included Blackett but notably excluded Lindemann. In January 1947, a Cabinet Committee authorised the ‘research and development of nuclear weapons’. William Penny, a theoretical physicist who had worked on The Manhattan Project was to lead on armaments development with Cockcroft leading research. Farmelo points out that Truman was unaware of the Quebec Agreement and could not even find a copy. Truman simply threw it aside. In August 1954, Congress passed ‘The McMahon Act’ which made ‘it illegal for any American to share nuclear information with any other country’. Blackett, typically, asserted that we should renounce nuclear weapons and be politically neutral. However, Attlee wanted The Bomb. When Congress was made aware of the terms of The Quebec Agreement, there was consternation that the British had a veto over US use of The Bomb. This was revoked along with the US having the power to halt the development of a UK nuclear power industry. The Quebec Agreement was dead. Bill Penney had witnessed the Nagasaki bomb as an ariel observer. When appointed to set up the UK bomb programme he based his work at Aldermaston, to become ‘The Nuclear Weapons Establishment’. Penney concentrated on developing a 239Pu fuelled bomb, with an implosion mechanism of British design. Churchill was re-elected in 1951making his first speech on 6 November, 1951 and was the first British leader to be potentially armed with nuclear weapons. Not surprisingly, Lindemann returned to The Cabinet as Paymaster General. There was, however, differences of opinion with Churchill saying that the UK should use US made weapons, not make our own and simply ‘be skilled in the art of ‘The Bomb’. ‘Churchill’s Bomb’ was successfully tested on 30 October, 1952 and eight days later America exploded the first Hydrogen Bomb, or H-bomb. Churchill acted, having had a change of view and appointed Sir Christopher Hinton to build factories to make 235U and 239Pu in significant quantities and manufacture nuclear weapons. Reactors were to be built at Windscale (now known as Sellafield) and Springfields Laboratory, where Uranium was extracted and enriched at Capenhurst. Crucially, this weapons programme was aligned with a domestic nuclear power programme. However, on both sides of the Atlantic nuclear power was low on the political agenda, being dominated by the H-bomb. This aroused division, with some scientists arguing for a halt in H-bomb testing as it would escalate the arms race with the Soviets, with Oppenheimer calling for a review of US nuclear strategy and came under severe scrutiny. Churchill believed that he could do business with Stalin and when he died, The Prime Minister believed that he could work with the new Soviet leadership. Churchill underwent an epiphany, however, when he fully understood the potential impact of a nuclear conflict. 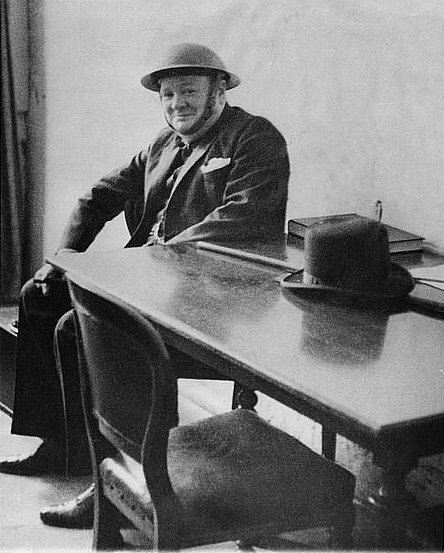 Churchill heard in mid-August 1953 that the Soviets had tested an H-bomb. Now, with the UK, US and the Soviet Union able to blow each other and the world to bits, it was the time to pursue peace. Churchill, while reading The Guardian newspaper on 18 February, 1954 an article that said of the H-bomb ‘.. the heat and blast generated in the 1952 hydrogen test would cause absolute destruction over an area extending three miles in all directions…..the Russians would be able to deliver [such an attack on the US] in ‘one or two years’. From that moment Churchill became obsessed by the H-Bomb and became determined that ‘The Big Three’ leaders should meet to reduce the likelihood of nuclear war. John Cockcroft was summoned to advise Whitehall on the hydrogen bomb. Cockcroft had accepted the job of running the Government’s nuclear research establishment, Harwell (while still being Director of the Chalk River facility in Canada). Cockcroft was on good terms with most nuclear scientists and administrators. He believed Churchill had been foolish to hand over Tube Alloys to ICI, was concerned about the influence of Lindemann and deprecated the sidelining of scientists such as Blackett. Cockcroft could not understand why the Americans did not demonstrate the first nuclear weapons on an uninhabited island. However, after nuclear weapons proved viable, Cockcroft believed his country needed them in order to defend itself. Cockcroft met Churchill and was invited to tour the Harwell and Aldermaston facilities. Commons debated the H-bomb on 5 April, 1954 and Churchill wanted a summit but President Truman disagreed. The Cabinet was amazed to hear that Churchill had approved the decision to build the H-bomb. Churchill explained that it was essential Britain acquire the H-bomb to preserve its global influence, make defence cuts and avoid giving the impression of disarmament and doing anything to ‘weaken our power to influence United States policy’ Fermalo points out that Churchill was looking for a grand exit from politics, with his government simply treading water towards the end of 1954, but in February 1955, the Government publishes a White Paper to explain why the UK should acquire the H-bomb. When the issue was debated in the Commons, Churchill argued that the H-bomb was an unavoidable reality, but disarmament ‘must not cloud our vision’. The only sane policy was ‘defence through deterrence’. Churchill stood down on 6 April that year and never spoke in the Commons again. Fermalo finishes his book with an account of the later activities of Rutherford’s ‘boys’. Mark Oliphant, an Australian was appointed a research director of The Australian National University in Canberra. Blackett was now at Imperial College and re-established his influence with Attlee and the new Labour administration. Blackett turned down a ministerial appointment, but did eventually accept a place in The House of Lords. James Chadwick became Master of his former Cambridge College, Gonville and Caius and G.P. Thompson Master of Corpus Christi College. Frisch became Professor of Physics at Cambridge University, but never talked about his time on The Manhattan Project. Peierls became Professor of Physics at Oxford University, was always willing to talk about the development of The Bomb and committed himself to an international movement campaigning for a freeze on nuclear armaments. On every Saturday morning, whatever the weather , he was to be seen dressed in shirt and tie at local shopping centres ready to explain his views to anyone interested enough to listen. Graham Fermalo has produced a fine narrative and explains in a clear, lucid manner Churchill’s often confused views on The Bomb and possible deployment. Faber and Faber, London 2013, 576 pages, hardcover. Martin Underwood is based in the Sub-Department of Particle Physics, University of Oxford, and is an Affiliated Research Scholar at the Dept of History and Philosophy of Science, University of Cambridge. An earlier version of this article was published in the email newsletter of the International History, Philosophy, and Science Teaching Group (IHPST); it is here reproduced with kind permission from the IHPST newsletter’s editor, Michael R. Matthews.